My armchair-psychological rundown of some of the non-political factors at play in "The Battle of Castledowns" (h/t Colby Cosh for the name) has been the far-and-away most popular story on this blog this week (thanks to Small Dead Animals, a statement I would have told you 2 days ago would have applied to this morning's Corner Gas taxation rant). 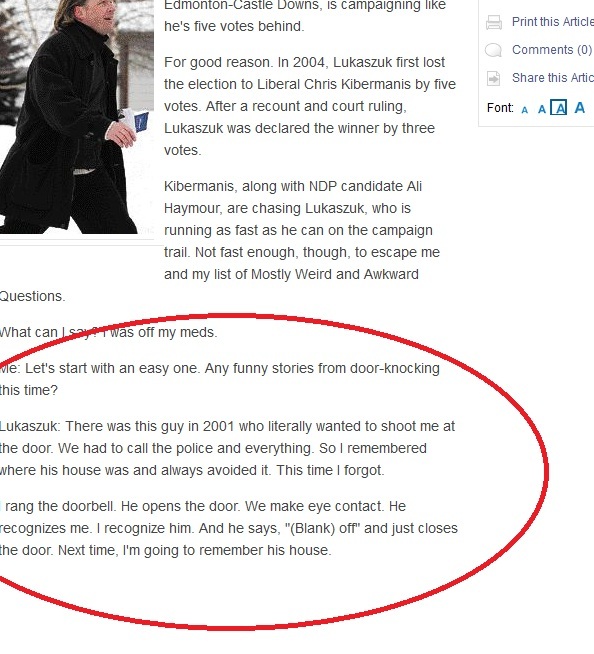 On the night this happened, myself/Colby/Ezra Levant were told of a "notice of trespass" given to Lukaszuk from Michalchuk. The notice can be oral or written, so its likely a he said/he said scenario. Or maybe not? Or maybe Lukascuk just happens to attract a lot of very very angry voters at him? In a riding that has swung PC/Liberal? What does that tell you?